Blevin's Gap is a small pocket of wilderness and wildlife beauty in Huntsville offering scenic vistas, rock overhangs and sandstone bluffs for great hiking, running and mountain biking. Two trailheads. 1.8 miles for the Fanning Trail, Bill and Mary Certain Trail 1.9, Sugar Tree 1.5, Smoke Rise 1.3, Vernadoe 1.8 and Walsingham Connector .19 miles. 2 - Steep, rocky climb, mostly marked, elevation 800 to 1300 ft. Wear sturdy, but comfortable hiking boots or shoes and use hiking sticks. 1-3 hours, depending on your time allotment, you can quickly hike, if you're experienced in about an hour. Spring is beautiful with new growth and flowers. Fall is equally vibrant with crisp Autumn leaf changes. Anytime would be great, except when its raining due to the slippery rocks and leaves and elevation climbs. Hidden in plain sight within Huntsville city limits is Blevins Gap Nature Preserve, a respite for an hour or a day. 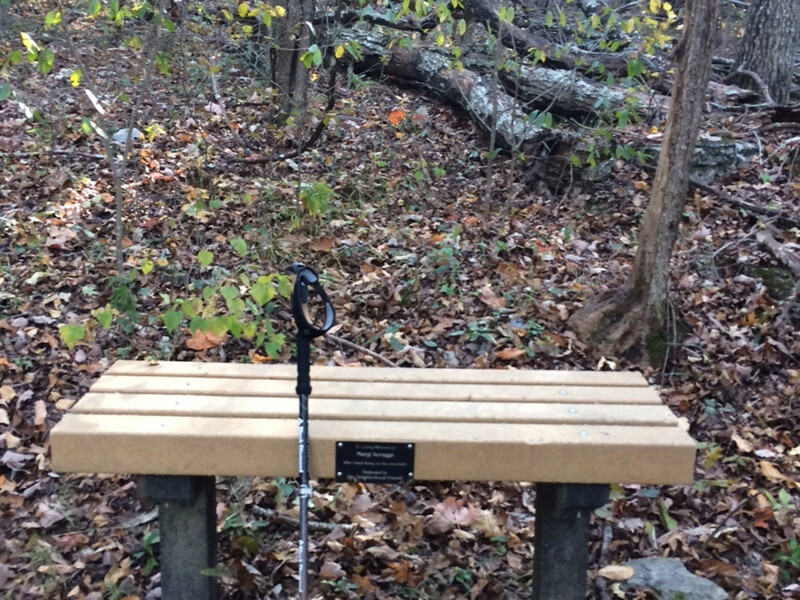 This mature forest with endangered vegetation was the first piece of property donated to Alabama’s first land trust (Land Trust of North Alabama) and contains the southernmost remnant of the Space Walk Trail created by the Boy Scouts in the 1960’s. Locals and visitors will enjoy exploring the “Little Appalachian”, in the Cumberland Plateau, with its’ beautiful scenic vistas, rock overhangs, and boulder art sculpted by nature. Blevins Gap Preserve trails vary in width and terrain, from approximately 12” up to 36” or more, depending upon the season too. From packed soil and gravel to steep ascents with tree root staircases and jagged boulders to tall vegetation and sandstone bluffs. Keep a sharp eye out for deer and other wildlife as you venture into a pocket of urban wilderness. If you’re out early enough, you may catch Does resting on their beds with their offspring. A snap of a twig under your foot and they are quick and silent as they scatter and disappear into the pristine forest. These trails are great for hiking, running and mountain biking; whether you have one hour to recharge your batteries and meditate or want a challenging workout, mother nature wont disappoint. Fanning Trail, accessed from the Huntsville Mountain Trailhead, immediately commences with climbing from about 800 feet and switchbacks up the mountain, with a few well placed benches along the way, up to 1200 feet until you plateau for a while before descending into a glen. 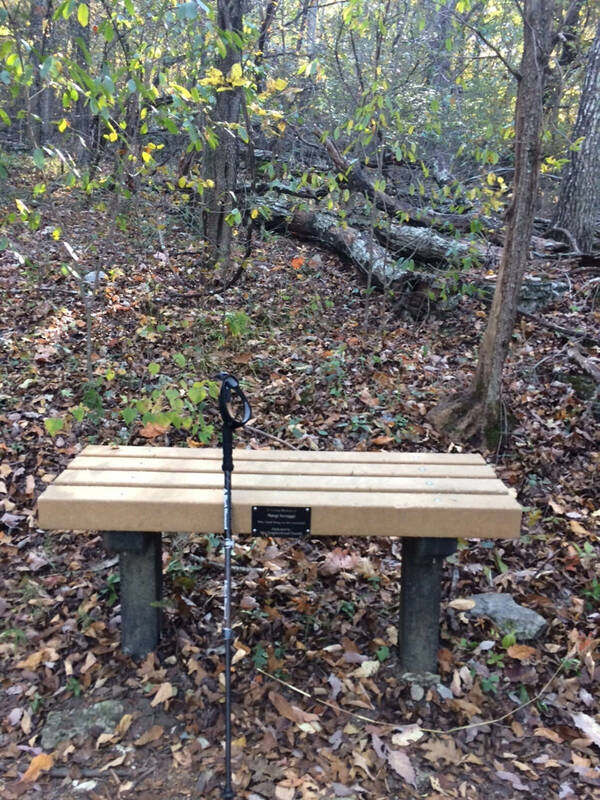 Fanning Trail, named for the first land donor, is approximately 1.8 miles (one way), listed as going out and back, looks to have an extension on the trail (ribbons around trees), taking you out to Cecil Ashburn Drive. It’s a slippery slope from the makeshift trail to the busy street less than half-mile from stopping point. 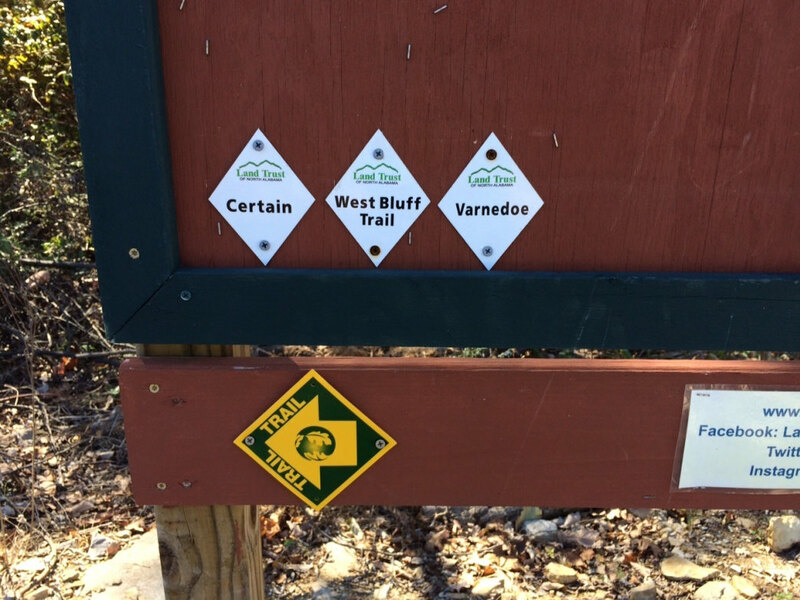 Walsingham Connector Trail is .19 miles and veers off from Fanning Trail and is out and back with minimal climbing from approximately 1200 to 1100 feet, out and back. This connector can also be reached through a residential area. A latticework of equally breathtaking and arderous trails, from the Blevins Gap Trailhead, include: Bill and Marion Certain 1.9 miles and climbs from 1300 feet up to 1500 feet, a popular hiking trail due to the views of the city, Smoke Rise Trail 1.3 miles, Sugar Tree Trail 1.5 miles and Varnedoe Trail 1.8 miles. Blevins Gap Preserve is a crowd pleasing esplanade offering moderate multi-use trails inside the city limits for kids (and big kids) of all ages. Whether you're a novice hiker or expert runner, your recess time will be made more valuable as you embark into the vibrant verdant forest at Blevins Gap. These trails will endear you as each time can be like it's the first time with the views, the wildlife and with the change of seasons. Enjoy them by yourself, with friends or as part of a guided hike provided by the Land Trust. Sturdy, comfortable boots and hiking poles are both good ideas -- and don't forget your camera! Blevins Gap Trailhead: From Alabama I-565 to Memorial Parkway South, take Airport Road exit. Go east on Airport Road which becomes Carl T. Jones Drive. Turn left onto Cecil Ashburn Drive. First trailhead is in the northeast corner of the Southeast Huntsville Church of the Nazarene parking lot. Huntsville Mountain Trailhead: Continue on Cecil Ashburn Drive to the top of the mountain for the second major trailhead on right. Dogs are welcome, on a leash. No breed restrictions. Please be responsible parents for your four-legged friends, for their safety too. No fees, free parking. Hours are from sunrise to sunset, year-round.